Eureka! is a five year Girls Inc. program that brings 8th - 12th grade girls, including many who will be first generation college applicants, onto local college and university campuses for an intensive STEM summer program. The Girls Inc. Experience empowers girls to succeed. Girls Inc. provides girls with trusting, mentoring relationships, a girls-only environment, and research-based, hands-on programming. Three critical goals drive our programming: to help girls achieve healthy lives, succeed academically, and acquire the life skills needed to prepare them for adulthood. Our work ensures girls' participation in programs and activities that support and expand on their school-based learning and engagement. It is also important that girls are motivated to set and achieve educational and career goals, particularly in science, technology, engineering, and math (STEM). Already in Eureka!? Click here! Girls Inc. Eureka! is a STEM-based approach to engaging and empowering 8th - 12th grade girls to see themselves as an important part of the workforce of the future. During the Eureka! 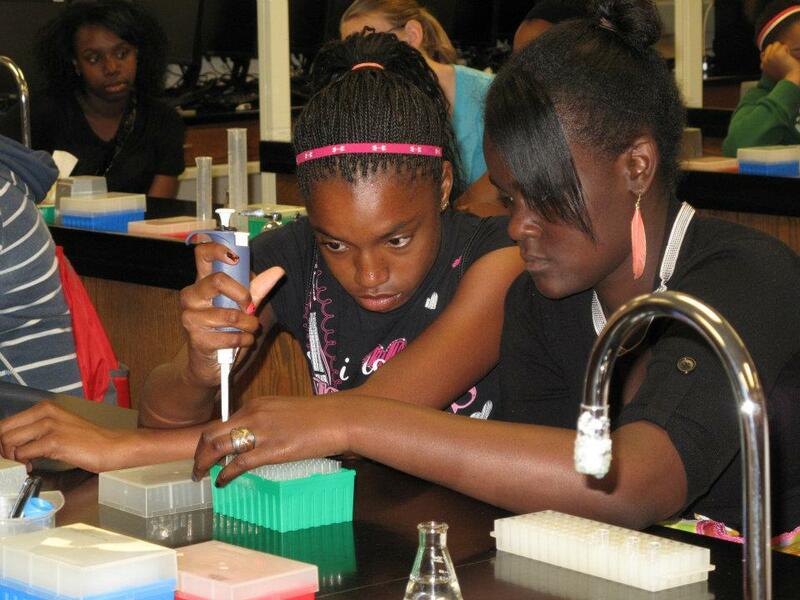 program, girls get to participate in a variety of exciting and compelling activities that explore STEM - nano sciences, robotics, DNA research, forensic science - through hands-on experiences in a college campus environment. With complementary activities in sports and physical fitness, healthy living, and financial literacy, Eureka! fully fosters educational, professional, and personal development. Eureka! is a five year program that brings girls, including many who will be first generation college applicants, onto local college and university campuses for an intensive summer program. As Eureka! continues through the school year, cohorts of 30 girls stay together throughout the course of the program, sharing hands-on, minds-on, untimed and ungraded opportunities for guided exploration and skills and knowledge building. Eureka! helps girls understand STEM career opportunities and be well prepared to join the community's workforce in these fields. Without intervention, girls' interest and confidence in STEM-related fields can begin to wane as early as elementary school. Between 4th and 8th grade, more girls than boys begin to turn away from science, technology, engineering, and math, making it critical to engage girls in middle school before they begin making selections for the high school classes they need to pursue in STEM careers. The issue is not just about curiosity in the subject matter, but also confidence in the skills needed to do the work. For girls, building self-assurance in their abilities in STEM areas early in their education is key, as is ongoing reinforcement throughout high school. The successful Eureka! program is a community-wide effort that thrives on partnerships and interaction with schools, community-based organizations, and local businesses and corporations. Girls need exposure to real career opportunities and Eureka! incorporates multiple internships during the high school years. Local partners also provide volunteer support, field trips, and funding for the program, ensuring that girls meet role models and mentors who provide support and inspiration. While Eureka! is one of Girls Inc. of the Pacific Northwest's newer programs, Girls Inc. affiliates have reported exceptional results. Data show that girls participating in Eureka! stay engaged in math and science through high school, preparing them for a world that is increasingly technological. Many Eureka! girls go on to college, making up a high percentage of Girls Inc. scholarship recipients each year, and often becoming the first in their families to attend a university. In Alameda County, an average of 80% of Eureka! girls indicated that they are interested in pursuing careers in the medical fields as surgeons, doctors, nurses, and more. Girls in their third and fourth years also listed marine biologist, scientist, engineer, zoologist, and crime scene investigator / forensic scientist. In Orange County, 90% of girls in their first year can list the A-G requirements to be eligible for entrance to a California state university, up from 9% who could do so before the program. As Girls Inc. of the Pacific Northwest expands its programming, we look forward to sharing similar results to those affiliates in California. If you are interested in supporting Girls Inc. of the Pacific Northwest's Eureka! program, please contact Juanes Collazo, Eureka! Program Manager, at juanes@girlsincpnw.org or (503) 230-0054 x111. Thank you to our generous Eureka! Sponsors!